Organiser of "Data Science: Theory and Applications"
Professor Mathar concluded the lecture series on Information Theory with a research oriented presentation "An Information Theoretic View on Learning of Artificial Neural Networks". 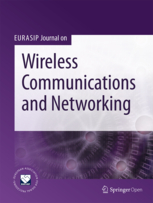 Dr. Yulin Hu serves as a member of the Editorial Board of the EURASIP Journal on Wireless Communications and Networking. The paper "A Compressed Sampling for Spherical Near-Field Measurements" co-authored by Cosme Culotta-López, Arya Bangun, Arash Behboodi, Dirk Heberling and Rudolf Mathar received the 2nd best student paper award at the 40th Annual Meeting and Symposium of the Antenna Measurement Techniques Association (AMTA 2018). Emilio Balda was the winner of the first prize in the student paper contest at the Asilomar Conference on Signals, Systems and Computers. He won the prestigious award for the paper "On Generation of Adversarial Examples Using Convex Programming", co-authored by Arash Behboodi and Rudolf Mathar. Dr. Yulin Hu serves as the lead guest editor for a special issue on "Ultra-Reliable, Low-Latency and Low-Power Transmissions in the Era of Internet-of-Things" of Physical Communication. Detailed information can be found Physical Communication. CoSIP retreat on compressed sensing and learning theory was successfully held in Spa, Belgium on September 12-13. The retreat was composed of gradate students and senior researchers from the group of prof. Rodulf Mathar (RWTH-TI), prof. Holger Rauhut (RWTH-LS C) and prof. Massimo Fornasier (TUM). For more details, please visit the CoSIP website. J. 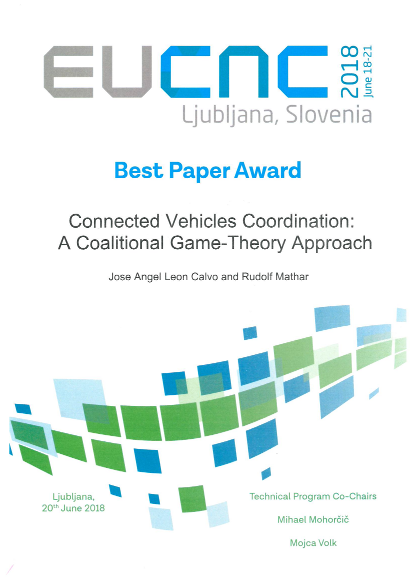 A. L. Calvo and R. Mathar received the best paper award for their contribution "Connected Vehicles Coordination: A Coalitional Game-Theory Approach" at the 2018 European Conference on Networks and Communications (EuCNC) in Ljubljana, Slovenia. Anke Schmeink is co-organizing the IEEE International Workshop on Cyber-Medical Systems in conjunction with the IEEE International Conference on E-health Networking, Application & Services, see the open call. 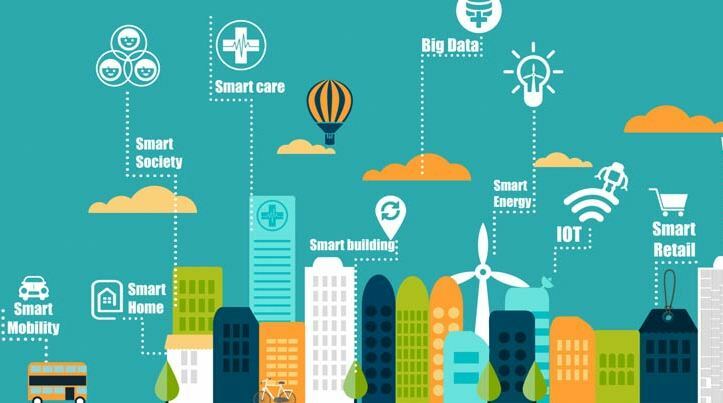 Dr. Anke Schmeink, Guido Dartmann and Houbing Song are editors of the forthcoming book “Big Data Analytics in Cyber-Physical Systems” of the Elsevier’s “Smart Cities” series. Chapter proposal submission is May 15, 2018. Detailed information can be found in the PDF. More information about the new series can be found here. the DFG priority program 1798 "Compressed Sensing in Information Processing" (CoSIP) is extended for another period of three years. The report and on-site review symposium took place in Berlin on February 21, 2018. Dr. Yulin Hu serves as a member of the editorial board of Physical Communication (Elsevier) since Jan 1, 2018. Dr.-Ing. Georg Böcherer was awarded the highly recognized Johann-Philipp-Reis-Preis for his work "Probabilistic Amplitude Shaping". Foundations were laid in his doctoral thesis at TI on "Capacity-Achieving Probabilistic Shaping for Noisy and Noiseless Channels". 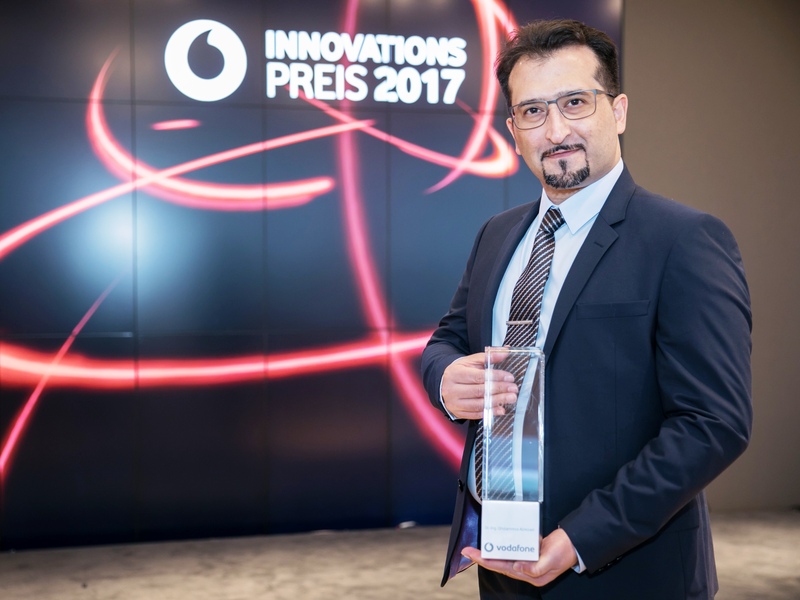 Dr. Gholamreza Alirezaei received the prestigious Vodafone prize for his contribution to sensor networks. J. 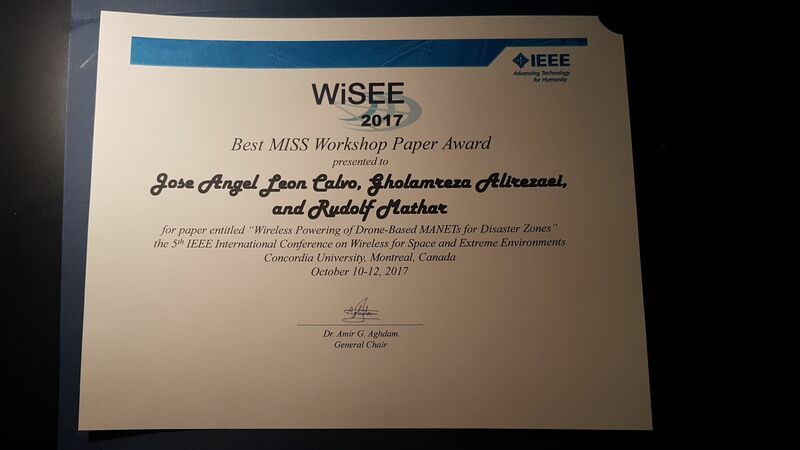 A. L. Calvo, G. Alirezaei and R. Mathar received the best paper award for their contribution "Wireless Powering of Drone-Based MANETs for Disaster Zones" at the 2017 IEEE International Conference on Wireless for Space and Extreme Environments (WiSEE'17) in Montréal, Canada. 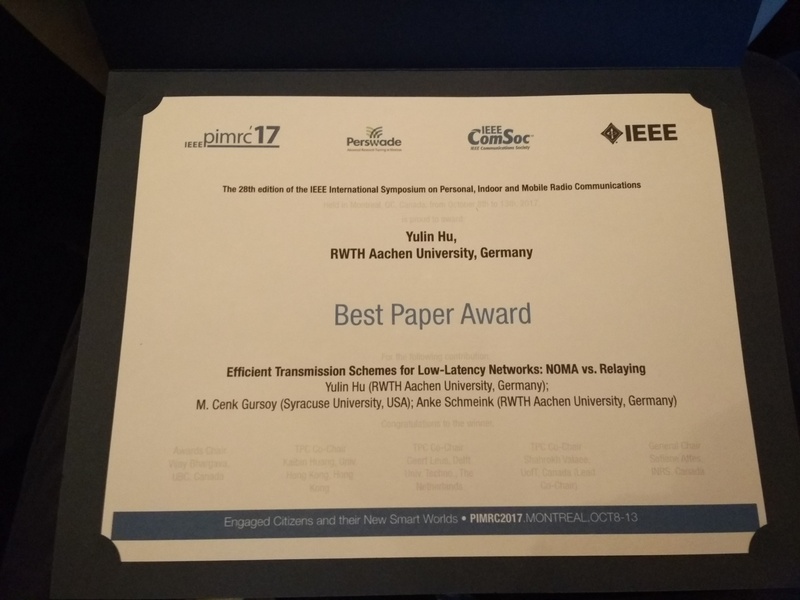 Yulin Hu, M. C. Gursoy and A. Schmeink receive the PIMRC 2017 Best Paper Award for their contribution “Efficient Transmission Schemes for Low-Latency Networks: NOMA vs.Relaying”. 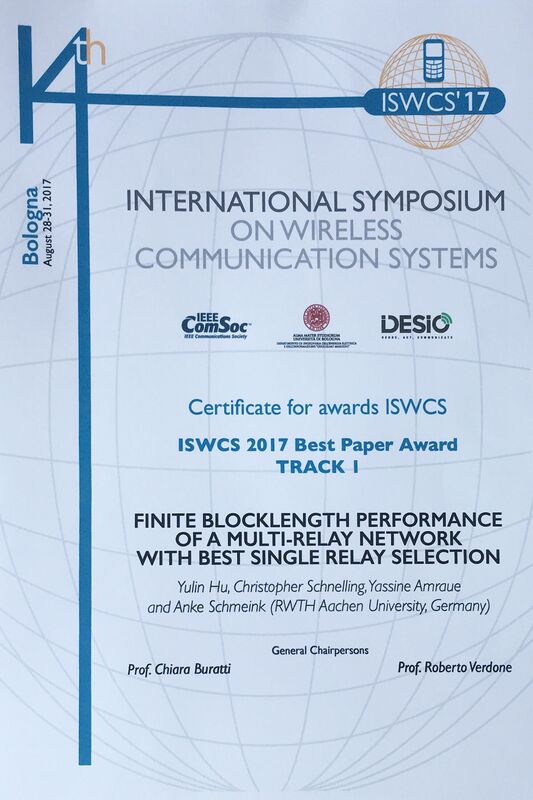 Yulin Hu, Christopher Schnelling, Yassine Amraue and Anke Schmeink receive the ISWCS 2017 Best Paper Award Track I for their contribution “Finite Blocklength Performance of a Multi-Relay Network with Best Single Relay Selection”. The International Symposium on Information Theory - ISIT 2017 takes place in the Eurogress Aachen from 25 to 30 June 2017. General co-chairs are Rudolf Mathar and Gerhard Kramer. There are 860 participants and 650 paper presentations. This year, David Tse is the Shannon lecturer. 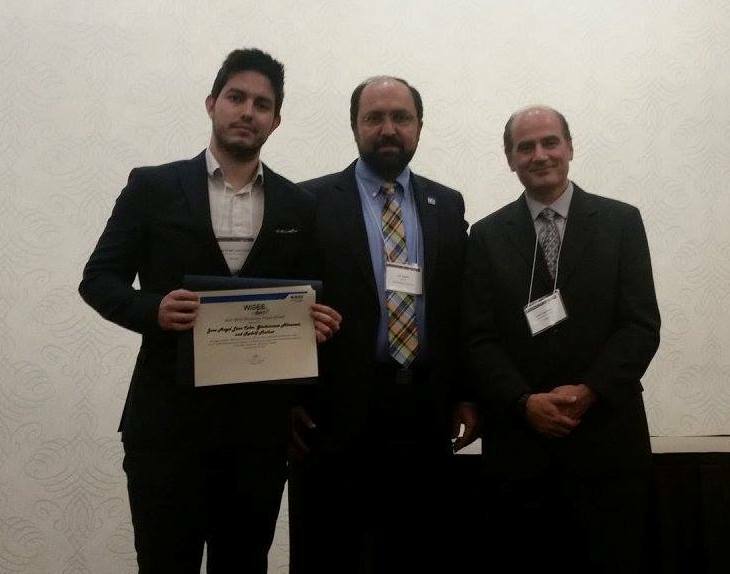 Alper Tokel, Gholamreza Alirezaei and Rudolf Mathar received the Best Paper Award for their contribution "Integrated Network Design for Measurement and Communication Infrastructures in Smart Grids" to the 26th International Telecommunication Networks and Applications Conference (ITNAC 2016) in Dunedin, New Zealand. The `IEEE International Conference on Wireless for Space and Extreme Environments' is held in Aachen from 26. to 29. September 2016. Gholamreza Alirezaei is the general chair and he will organize the conference at TI. Ali Abedi, Rudolf Mathar and Charles Rubenstein serve as executive co-chairs. We are looking forward to meet you at WiSEE'16 in Aachen. Martijn Arts and Rudolf Mathar receive the best paper award of The Eighth International Conference on Ubiquitous and Future Networks (ICUFN 2016) for their contribution "Performance Limits of Cooperative Eigenvalue-Based Spectrum Sensing Under Noise Calibration Uncertainty". The Roboterclub Aachen e. V. (RCA) has won this year's Eurobot in Stuttgart and is therefore the new German Champion. The RCA is a student association at RWTH Aachen University, affiliated to the Institute for Theoretical Information Technology (TI). The students designed and constructed two robots, which autonomously collect sand blocks, search for seashells and go fishing. Being qualified now for the Eurobot Open competition, they are already preparing their robots for the final contest in le Kremlin-Bicetre, Paris in June. Gholamreza Alirezaei receives the Friedrich-Wilhelm Award of RWTH Aachen for his outstanding work "Optimizing Power Allocation in Sensor Networks with Application in Target Classification". Gholamreza Alirezaei, Michael Reyer and Rudolf Mathar win the ITG award 2015 for their paper "Optimum Power Allocation in Sensor Networks for Passive Radar Applications". The certificate will be presented on the 4th of November in Berlin. We have moved from the Walter-Schottky-Haus to the ICT cubes, third floor. You will find a site map by clicking New site plan. Halil Alper Tokel was admitted to the Rhenian Leadership College as a scholarship holder for 2015, see Rheinisches FührungsColleg. Rudolf Mathar serves as Pro-Rector for Research and Structure at RWTH Aachen University. His period of office will be four years. Jose Angel Leon Calvo, Xiang Xu and Florian Schröder received a Best Paper Award for their paper "Investigation on Mobile Radio Propagation Channel Models based on Measurement Data" at the 18th International Student Conference on Electrical Engineering (POSTER 2014). Hanzhi Zhang is awarded the Springorum-Denkmünze for his outstanding Master of Science. M. Sc. 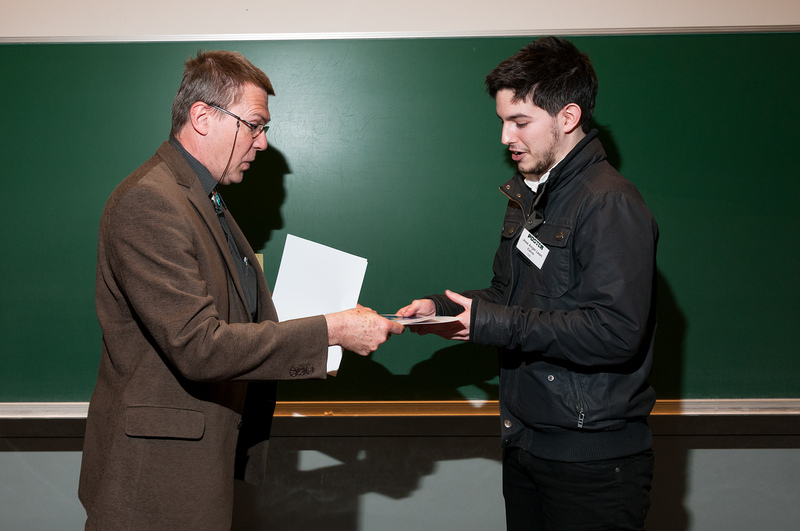 Marius Cordts receives the SEW-Eurodrive Award for his Master thesis on "Investigating Lateral Information Processing in the Olfactory System Using Optimization Theory". 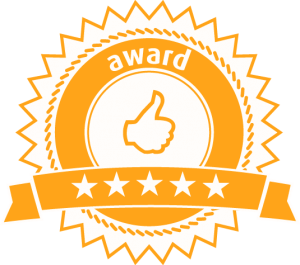 Melanie Neunerdt, Michael Reyer and Rudolf Mathar received the Third Best Paper Award for their paper A POS Tagger for Social Media Texts trained on Web Comments at the 12th Mexican International Conference on Artificial Intelligence (MICAI'13). The award was presented by Dr. Alexander Gelbukh. Gholamreza Alirezaei and Rudolf Mathar received the Best Paper Award for their paper Optimum Power Allocation for Sensor Networks that Perform Object Classification at the IEEE Australasian Telecommunication Networks and Applications Conference (ATNAC'13). The award was presented by Dr. Murray Milner. Gholamreza Alirezaei, Rudolf Mathar and Pouya Ghofrani received the Best Paper Award for their paper Power Optimization in Sensor Networks for Passive Radar Applications at the Wireless Sensor Systems Workshop (WSSW'13), co-located with IEEE International Conference on Wireless for Space and Extreme Environments (WiSEE'13). Exactly eight months after the first spadeful of earth was turned on the 4th of March, the topping out ceremony for the ICT cubes was held on 4 November 2013. It is clearly visible that the ICT chairs will inhabit a spacious, well-lit building of extraordinary design. TI is looking forward to moving in, predicted for February 2015. On its meeting in Istanbul on 7 July 2013, the Board of Governors of the IEEE Information Theory Society has decided to allocate the International Symposium on Information Theory - ISIT 2017 to Aachen. TI will be the local organizer. Rudolf Mathar and Gerhard Kramer are the general co-chairs. Sennur Ulukus, Stephen Hanly, Martin Bossert, and Stephan ten Brink serve as TPC co-chairs. We are looking forward to organizing the flagship conference of IEEE ITSoc. An extension of Claude Elwood Shannon's ultimate machine, made by Roboterclub Aachen e. V. (RCA). The Roboterclub Aachen e. V. (RCA) has successfully completed this year's Eurobot season! The RCA is a student association at RWTH Aachen University, affiliated to the Institute for Theoretical Information Technology (TI). The students designed and constructed a robot, which autonomously unwrappes gifts, blows out candles, inflates balloons and builds high glass pyramids. After the team won the German Championship in Hamburg the students achieved the third place in the international competition Coupe de France de Robotique / Eurobot 2013 in La Ferté-Bernard in France. On a warm and sunny day the first spadeful of earth was turned for the ICT cubes, the future home for six institutes of the Faculty of Electrical Engineering and Information Technology. Rektor Ernst Schmachtenberg and Dean Rudolf Mathar spoke in high terms of the future opportunities for research and cooperation. TI will also move to the new building, promised to be completed by end of 2014. On the occasion of the Mobile World Congress 2013 in Barcelona the Institute for Theoretical Information Technology (TI) receives the "HUAWEI Proactive Contribution Award". The contributions of TI to the joint research project "Self-Organization for 4G Multi-Tier Networks" are honored by this award. Dr. Jianjun Wu, the director of HUAWEI's 2012 Lab European Research Center division, presented Rudolf Mathar and Alexander Engels with the award. Der Verein der Freunde und Förderer der Theoretischen Informationstechnik e.V. nimmt ab sofort Mitglieder auf. As a past recipients of the Vodafone Inovation Award, Rudolf Mathar contributes some thoughts about the future of mobile communications at blog.vodafone.de/tag/innovationspreis. The Mobile World Congress is the largest exhibition of mobile communication systems in Europe. This year it took place in Barcelona 27 February - 1 March 2012. As part of UMIC, TI has presented its recent research on self organization of multi-tier and layered networks. Anke Schmeink serves as the lead guest editor for a special issue on "Recent Advances in Optimization Techniques in Wireless Communication Networks" of the EURASIP Journal on Wireless Communications and Networking. Rudolf Mathar serves as the chair of the IEEE Information Theory Society Germany Chapter. Meik Dörpinghaus is awarded the Friedrich-Wilhelm Preis of RWTH Aachen for his outstanding PhD thesis. Georg Böcherer, Fabian Altenbach, Martina Malsbender, and Rudolf Mathar won the Best Paper Award for their paper Writing on the Facade of RWTH ICT Cubes: Cost Constrained Geometric Huffman Coding at the ISWCS 2011. M. Malsbender is working for kadawittfeldarchitektur. ISWCS'11 - The 8th International Symposium on Wireless Communication Systems took place in Aachen, Germany, 6th - 9th November, 2011. Rudolf Mathar was the general chair, Gerhard Kramer and Kwang-Cheng Chen served as the technical program chairs. Public announcement can be found here . Milan Zivkovic, Johannes Schmitz and Rudolf Mathar won the Best Technical Presentation Award for their SDR demonstrator on Acquisition and Identification of OFDM Signals using Cyclostationary Signatures at the WINCOOL demo competition accompanying the WINTECH workshop2011 in Las Vegas. The paper Joint BS Selection and Subcarrier Assignment for Multicell Heterogeneous OFDM Unicasting by Chunhui Liu, Peng Wang, Anke Schmeink and Rudolf Mathar won the Best Student Paper Award at the IEEE conference PIMRC 2011 in Toronto. Rudolf Mathar serves as the dean of the Faculty of Electrical Engineering and Information Technology. Starting from summer semester 2011, the institute is offering a new Lab (Praktikum) for M.SC. or Diploma (Hauptstudium) students. For more information, please click on the PDF file. Feel also free to contact our teaching assistants. Rudolf Mathar was elected member of the North Rhine-Westphalia Academy for Sciences and Arts. Members from TI and the group of Prof. Dr. Joachim Buhmann, Professor for Information Science and Engineering and Head of the Machine Learning Laboratory, organize a joint one-day workshop at ETH Zürich. Presentations and discussions include machine learning, graph based pattern recognition and picture segmentation, bio-inspired information processing, and applied optimization for communication systems. The GSMA Mobile World Congress is the largest exhibition of mobile communication systems in Europe, this year taking place in Barcelona 14 - 17 February 2011. Two institutes of RWTH Aachen University, TI and IND jointly present recent research from UMIC. Binaural conference telecommunication from IND is carried over an optimized OFDM radio link from TI. Optimized OFDM is considered to improve capacity, quality and robustness of next generation mobile standard LTE+. Marius Cordts who has written his bachelor thesis at TI has won the "Rohde & Schwarz Best Bachelor" award. He received the price during the "Tag der Elektrotechnik und Informationstechnik 2010". The demonstration "A Reconfigurable Adaptive OFDM Testbed for Binaural Audio-Visual Communications", developed jointly with the Institute of Communication Systems and Data Processing (IND), was presented at the 2. Tag der Informations- und Kommunikationswirtschaft Nordrhein-Westfalen (IuK-Tag NRW), held in Wuppertal, on 10th November 2010. Organized by the Ministry of Economic Affairs, Energy, Building, Housing and Transport, the IuK-Tag NRW is the high ranking annual meeting which gives impulses for future strategies for the IT business sector of NRW. "Kinderuni - Children's University" is a series of lectures regularly given at RWTH Aachen University for children aged 8 to 12 years. This time, Professor Mathar presented a talk entitled "Why does my mobile phone always know its location" to about 700 children. A team from TI, Melanie Neunerdt, Alexander Engels, Florian Schröder, Henning Maier and Meik Dörpinghaus, demonstrated in a life performance how mobile devices connect to a cellular network. Marius Cordts and Daniel Rüschen, both writing their bachelor thesis at TI, won this year's case study competition by Rohde & Schwarz and VDE. Together with their team "Gauß Krach" they found bright solutions to a series of technical problems related to DVB-T and its successor, DVB-T2. Furthermore, reflection on economical performance and the overall presentation style were assessed by highest grades. The Institute for Theoretical Information Technology (TI) demonstrated recent research achievements on radio resource management at the 3rd NGMN Industry Conference & Exibition. Recognized speakers and panelists from the entire mobile world presented commercial and technological achievements and challenges ahead, and gave an outlook on upcoming technology developments. TI's SDR testbed for optimal resource allocation in OFDM(A) was presented at the co-located exibition where leading mobile technology vendors showed next generation network solutions. EUROBOT is a recognized international robot contest. Each year a different task has to be solved by autonomous robots, this year collecting tomatoes and oranges on a playing field scattered with obstacles. The Roboterclub Aachen e.V., hosted by TI, won the second prize in Zurich 2010. Congratulations! The 8th International ITG Conference on Source and Channel Coding 2010 (SCC 2010) took place in Siegen, Germany, 18-21 January 2010. Rudolf Mathar was the Program Chair. A brief report may be found here. The paper "Power allocation for social benefit through price-taking behaviour on a CDMA reverse link shared by energy-constrained and energy-sufficient data terminals" by V. Rodriguez, F. Jondral, and R. Mathar was selected as one of the five best papers out of 143 at the IEEE ISWCS 2009 (Siena, Italy) and hence is eligible for inclusion in a special issue of the prestigious ACM/Springer journal "Mobile Networks and Applications". As the first recipient ever, Anke Schmeink is awarded the highly endowed Helene-Lange-Award for young female scientists at the University of Oldenburg. Rudolf Mathar is elected chairman of ITG/VDE Technical Committee 5.1, Information and System Theory. Milan Zivkovic, Dominik Auras and Rudolf Mathar receive the second prize in the WinCool demonstration contest at The Fourth ACM International Workshop on Wireless Network Testbeds, Experimental Evaluation and Characterization (WiNTECH 2009), co-located with Mobicom 2009, for their research demonstrator entitled "A reconfigurable framework for adaptive OFDM transmission". The Chair for Theoretical Information Technology (TI) and the Chair for Computer Graphics and Multimedia (I8), both members of the cluster of excellence UMIC, jointly demonstrate progress towards ultra-high speed communication at CeBIT 2009. Anke Schmeink is affiliated with the Junge Kolleg of the North Rhine-Westphalia Academy for Sciences and Arts. Virgilio Rodriguez, Rudolf Mathar and Anke Schmeink receive the best paper award of the Australasian Telecommunications Networks and Applications Conference (ATNAC 2008). The prestigious award consists of a cash prize and a research visit to the Institute for Telecommunications Research (ITR), University of South Australia, including accommodation and living expenses. Dr. Daniel Catrein is awarded the renowned Gertraude Holste Preis of RWTH Aachen University for his outstanding PhD thesis. 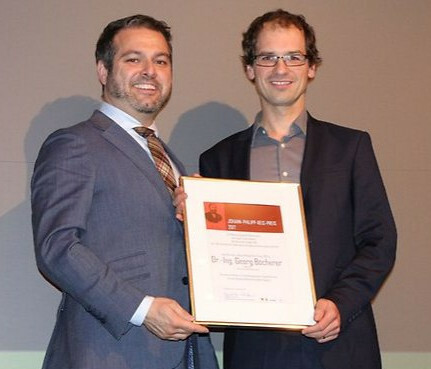 Dr. Thorsten Clevorn receives the prestigious VDE Dissertation Award. The slides of his thesis overview presentation are "here". Optimal power allocation to subcarriers in OFDM advances. Aus dem Magazin der Aachener Zeitung: "Mathe - kann ich nicht". Ein Interview mit Professor Mathar.